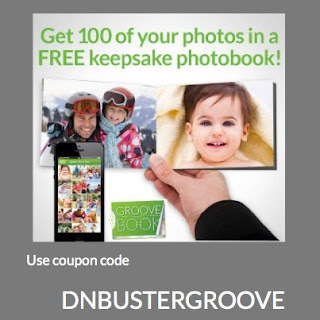 DnBuster's Place: Try GROOVEBOOK for FREE!! or other device(I uploaded my pics from my iPads) and turn it into a beautiful 4.5" x 6.5" photobook for FREE and mails it to you monthly! Your photos are printed on glossy photo paper and perforated for easy removal. That means you can share, frame, decorate, scrapbook and more. for up to 100 pictures! Use code DNBUSTERGROOVE to get your first book completely FREE even shipping and handling is FREE when you use the above code with their FREE app. NOTE~You will need to enter your credit card information to get started but if you don't want a new book monthly you can cancel anytime with a simple email. The app is not for Windows Mobile, so I can't get it. What a great idea! and so convenient. Would love to win some kid's cereal! Wow this is a really neat app. What a great looking app! This is really cool. Thank you for letting us know about it. This looks like a great app. if i had a cell iu'd deff use thsi! This looks great! What a cool idea. I recommended this to my sister. kristiedonelson(at)gmail(dot)com Thank you. I don't have a cell phone so I guess I can't use this. This looks like a great deal because it is free! I will take a look at it! Thanks so much! Neat idea. So easy to do. Looks cool, but I don't have a smartphone. This looks like a fun app. Thanks for the info on it! Hi there! Looks like an interesting app but I don't have a smart phone. The hair chalk looks like a fun option for my teenage daughter! i'm not too in to stuff that automatically bills every month but thanks for the info! Sounds awesome! Thanks for the info! How interesting! Like shutterfly books and such nice quality too! Looks cool. My android died so will have to check it out when I get a new one. I like to get this and see what it is like! I bet it is a great product to use! I really like this app,.